The Long Beach Peninsula (nearest harbor Nahcotta) is one of the best kept secrets of Washington. It is one of the largest continuous beaches around the world and the world’s longest drivable beach. It’s a staggering 28 miles long of breathtaking beaches, which run alongside the Pacific Ocean. It’s laid-back vibe has attracted expats from all over the world. It’s a town that can fulfill of all your needs and desires. It has lush national forests; pristine beaches, whale’s breeching, world-class fishing (especially for oysters!) and they even have an international kite festival! It’s the type of place that once you visit you will never want to leave. Everyone is not only abundantly friendly and welcoming (greeting you with a smile and a nod as you walk across the street). It’s like a storybook town, which has a certain allure to it. I have traveled a lot, and it’s not often where you find such a special place. There is something very endearing about Long Beach, which leaves you wanting to come back over and over again! If you are looking to relax, rejuvenate or have a romantic weekend away; look no further than the Boreas Bed &Breakfast! It’s central to town and easily accessible for a walk on the beach, the discovery trail or the nearest grocery store. Each room of the Inn has its own name and decor; making it lovely, relaxing and classic all rolled into one. The beds are extremely comfortable, and the rooms even have an electric fireplace; for when the nights get chilly. There is quite a large outdoor space for relaxing or entertaining. It has chairs, tables, a hammock and most importantly a private hot tub. With privacy comes a serene and tranquil experience. This works well if you just need a weekend away to unwind, or if you are on a romantic getaway with a loved one. The Inn is well kept and meticulous. The Owners Susie and Bill are FANTASTIC! They are warm, welcoming and extremely professional. Susie and Bill a make a three course plentiful breakfast each morning for their guests. Susie does not consider herself a professional chef (although she really should). She cooks with love, which is what makes the food that much more special. Everything is extraordinary from the quality, to the quantity and right down to the presentation. There is a reason why Borea’s has excelled as one of the top places to stay on the Long Beach Peninsula. It has exceeded my expectations and I would suggest to anyone coming to the Long Beach Peninsula to stay here. If you are looking for that one-of-a-kind special Long Beach experience, then head to the Pickled Fish. It’s located on the 4th floor of the Adrift Hotel. Get there just before sunset so you can grab a seat right by the window and watch the sun go down. Make sure to have your camera ready to go in order to take that beautiful magic hour photo of you and your family! They are also known for the delicious cocktails. Be sure to a look at their drink menu and don’t be afraid to try something from their personal distillery. Since I arrived to Long Beach, I kept hearing how wonderful the Depot was. As I recently experienced this place was hyped for a reason! This was as real as it gets. This restaurant has exceptional food. If you are a meat or seafood lover this is definitely the place for you. Well, now that I have actually eaten here I can say that this place is not over rated! The Discovery Trail is an estimated 8.5 mike trail (one way), which takes you from the north side of the peninsula to the south. You will travel along the same path as Lewis & Clark did in the early 1800’s. Since this path is paved you are able to run, jog or bike ride across it. I personally enjoyed waking up right after sunrise and having the trail nearly to myself. Make sure to keep your eyes peeled for wildlife along this route! Cape Disappointment State Park is located on the southwestern side of the Long Island Peninsula, in Washington. The name derives from the 1788 failure of Captain John Meares crossing the Columbia River. The reality though, is that this park is anything but disappointing! It’s filled with history, beauty and sweeping views of both the Pacific Ocean and the Columbia River. 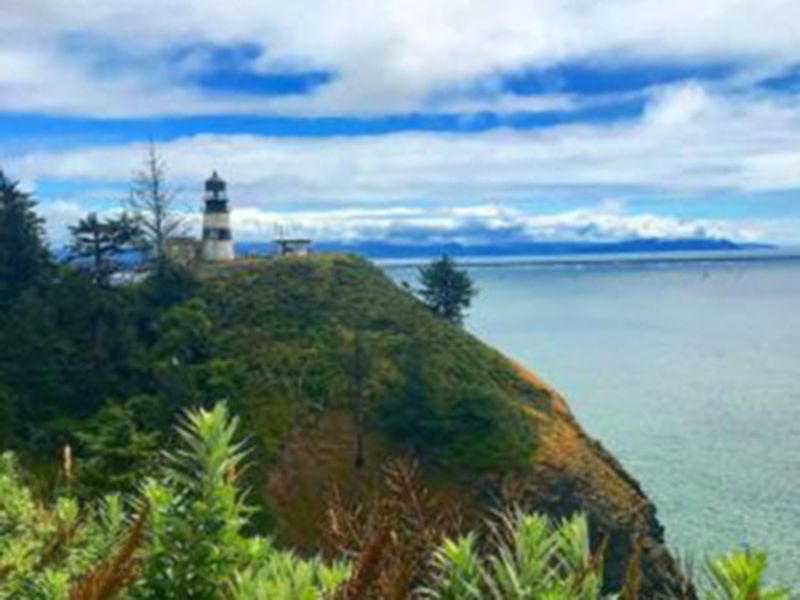 Make sure to take the hike to the Cape Disappointment Lighthouse to see some epic views! Oysterville, is as historic as they come, considering it is currently on the National Historic Registry and all. Make sure to take a proper walk through town to check out the charming and rustic appeal of this neighborhood. A trip to Oysterville wouldn’t be completely without a stop to the Oysterville Sea Farms. If you come during the summer, they do not serve raw oysters due to potential dangerous for illnesses caused by the water. However, you are able to try them smoked! If you just want a tiny taste of perfection make sure to try one of their shooters. Some of the world’s best oysters come from here so if you are a seafood fan this is a must try! Make sure to take a walk through the amazingly one of a kind World Kite Museum! You will see get to see kites form all over the world (Japan, China, Indonesia, USA). This is definitely a one of a kind exhibit so take your take walking through and really try to appreciate the amazing craftsmanship that was put into making these kite. Marsh’s Free Museum is located in the center of town. It’s a must see for anyone traveling to Long Beach. You are able to enter and walk around for as long as you would like and the best part is….it’s free! The store has the largest variety of things that you have ever seen, it’s completely random and that’s why people love it. When you enter make sure to ask someone working there where the Alligator man is! Rachael Jerahian, Lady with a Passport is a traveler, explorer, adventurer, and photographer currently completing 4 major travel expeditions. Following along with her adventures, and support her on her journey. Learn More.